The signing of the Agreement of the Terms of Employment by means of Chairman of the SCS Board Franklin Wilson, Mark Dodds and Tracy Zagers-Johnson of SCS, Orlando Mc. Pherson of Sacred Heart School, Elvin Henriquez of RCN/OCW, Commissioner Bruce Zagers and Director General of the Ministry of Education, Culture and Science Alida Oppers. 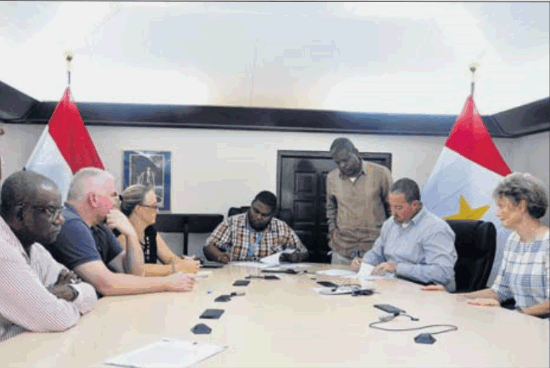 A new Agreement on the Terms of Employ­ment was signed on Mon­day for all school person­nel in Saba. The agreement includes a 3.4 per cent increase of gross salaries which goes into effect on January 1, 2019. Representatives of the Dutch Ministry of Educa­tion, Culture and Science OCW, the Public Entity Saba, the Department of Education, Culture and Science of National Gov­ernment Service Carib­bean Netherlands RCN/ OCW, Saba Comprehensive School (SCS) and Sacred Heart School were pres­ent at the brief signing cer­emony at the Government Administration Building in The Bottom. The agreement includes a 3.4 per cent increase of gross salaries. School staff members will benefit from the fact that the Dutch Gov­ernment is reducing the employers’ premiums in the Caribbean Netherlands per January 1, 2019. Director-General of the Ministry of OCW Alida Oppers ex­plained that this allowed for a pay rise without increasing the cost of wages. The measure, firstly de­signed to bring about a rise in the minimum wage, cre­ates room for an additional wage increase in educa­tion. This will bring the to­tal wage increase to 5.1 per cent per January 1, 2019. The signing of the agree­ment secures this salary in­crease. “I see this as extra support for the education you stand for, the education you work hard to realize every day”, said Oppers. Apart from Oppers and her delegation, Commissioner of Education Bruce Zagers, Reynolds Oleana and Elvin Henriquez of RCN/OCW, Chairman of the SCS Board Franklin Wilson, Mark Dodds and Tracy Zagers-­Johnson of SCS, and Orlan­do Mc. Pherson of Sacred Heart School were present at the signing. In September, parties had already arrived at an agree­ment for education person­nel in Bonaire, St. Eustatius and Saba. The day after the signing in Saba, a similar agreement was also signed in Statia, to be followed by Bonaire on Thursday. The agreement applies to school personnel in the en­tire Caribbean Netherlands, both teaching and support staff. Oppers said there was a “powerful commitment” to securing a high standard of education. “You deliver on this commitment. That is clear to us in The Hague. By jointly formalizing our agreements in the education agenda, we have sealed our collective commitment” she said. Part of the education agen­da is to establish clear and favourable terms of employ­ment for teaching staff as a precondition for achieving a high standard of education. “After all, good education starts with professional and dedicated staff,” who “de­serve good terms and condi­tions,” said Oppers.